Generally, the blowers in industrial equipments are driving by motor in constant speed operation, then adjusting the air flow by changing the fan inlet baffle opening degree. The biggest characteristic of the fan is the load torque is proportional to speed square, while the shaft power is proportional to speed cube. Therefore, energy-saving will be substantial if the fan's constant speed can be changed according to air flow demand by controlling motor speed. K is a constant, N is the efficiency. In the graph, Curve 1 is the fan's characteristic of pressure H and flow Q under constant speed, curve 2 is the pipe network characteristic (valve opening to 100%). Suppose the fan is designed to work at maximum efficiency in point A, output air volume Q1 is 100%, the shaft power P1 = Q1 * H1 which is proportional to the area AH10Q1. According to the system process requirements, when the air volume decreases from Q1 to Q2 (e.g. 70%), if adjusting the regulator valve to achieve air volume decreased, it's equivalent to increase the pipe network resistance to make it change Curve 3, the system operation point change from the original point A to point B, we can see in the graph, the pressure increased, the shaft power P2 and area BH20Q2 are not decreased much. If using variable frequency drive to adjust the motor speed, reduce the fan's speed from N1 to N2. According to the fan proportion formula, to draw curve 4 characteristic of the pressure H and flow Q under rotation speed N2, which we can see, air pressure H3 decrease significantly in the same air volume Q2 demand, and power P3 (area CH30Q2) also decrease significantly. The power savings △P = △HQ2 is proportional to area BH2H3C, the energy-saving effect is obviously. In theory, when the fan flow decrease to 80% and the speed drop to 80%, the shaft power will drop to 51% of the rated power; If the air flow decrease to 50%, the power P can will reduce to 13% of rated power. Of course, according to the actual working conditions, the actual energy savings can not reach to the theoretical value, but adopt variable frequency drive to control the air flow of the fan system, normally the saving rate can reach 20% - 50%, to meet the energy saving requirements. 1. Achieve soft start and stop smoothly with little impact to the power grid and mechanical equipment. 2. Precise control and smooth speed adjusting, wide speed adjustment range and can realize stepless speed regulation. 3. 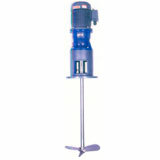 Easy operation, decrease maintenance requirement and lower maintenance costs. 4. Strong protection function for the system, the variable frequency drives built-in overvoltage, overcurrent, undervoltage, overload, overheating and phase-loss protection, etc. Variable frequency drive for refrigeration compressors A good stepless control of compressor rack capacity requires the use of an intelligent variable frequency drive (VFD) specially designed for refrigeration use. 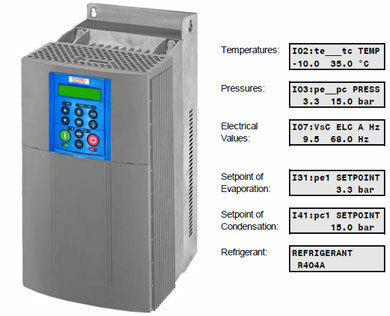 An "Intelligent" variable frequency drive for refrigeration use has various features which are not common with standard variable frequency drives for use in automation or industrial applications. The use of VFDs with integrated intelligence for the control of refrigeration compressors has been described in this article. 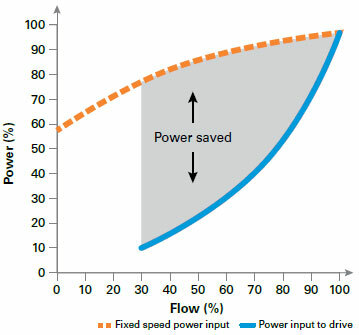 Variable frequency drive for pumps Like fans, using a variable frequency drive (VFD) to control the flow rate from a pump rather than using simple throttle control can result in large power – and therefore cost savings. This is illustrated in following Figure, where the broken line indicates the power input to a fixed-speed motor and the solid line indicates the power input to a variable frequency drive. The shaded area represents the power saved by using a variable frequency drive for a given flow. AC inverter drive in agitator Built-in slip compensation function realizes high efficiency. Advanced motor parameter auto tuning function. Built-in PID regulator in the frequency inverter. Friendly user interface, large screen LCD. Realize parameter online monitoring, online regulation, and parameter copy function to make operation more convenient. Torque control function enables the motor be able to run with a constant torque.